In honor of the approaching Hawaii International Film Festival (HIFF), which begins October 30th, this month’s repository spotlight shines on ꞌUluꞌulu: The Henry Kuꞌualoha Giugni Moving Image Archive of Hawaiꞌi. A work in progress, the archive’s 11,000 square feet will eventually contain an exhibition space, screening area, and computer terminals where individuals can view entire collections of digitized materials. This is in addition to restoring, preserving, cataloging, and digitizing moving images that are the heart of the archive. ꞌUluꞌulu, located in the UH West Oahu campus Library, is the official state archive for moving images and is dedicated to the care, preservation, and digitization of film and videotape related to the history and culture of Hawai‘i. There are currently over 17,000 videotapes, 250 motion picture film reels, and 300 hours of digitized footage in the archives’ collections. ꞌUluꞌulu fights against time to capture moments on film and tape that are disappearing due to the deterioration of materials and obsolescence of devices that can play them. Both documentary films were directed by local filmmaker George Tahara and document the decade-long restoration of the Palace from 1969-1979. These were recently digitized along with 47 other films from the Friends of ‘Iolani Palace collection at ‘Ulu‘ulu. The archival prints are 16mm motion picture film reels. ꞌUluꞌulu worked with a preservation lab to create digital preservation master and access files of all 49 reels. The footage includes scenes of the Palace interior and exterior pre-restoration. 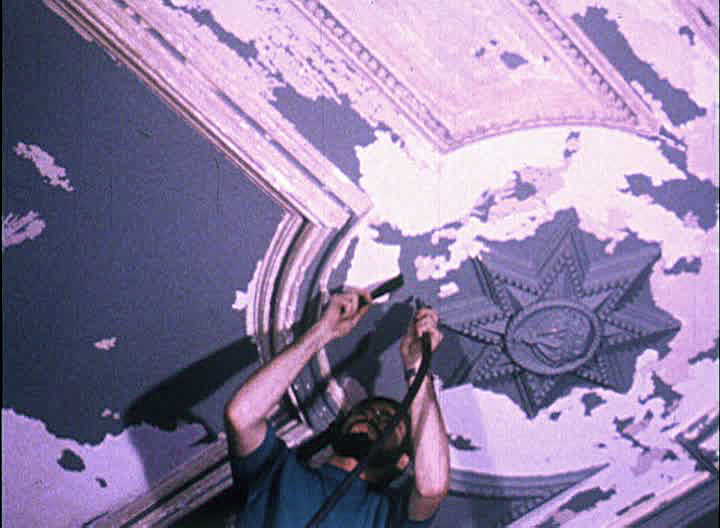 The Palace restoration footage includes scenes during the restoration process: artists and craftsmen repairing and refurbishing original doorways, chandeliers, staircases, floors and glass plate windows. ꞌUluꞌulu’s Archival Film Screening Night at the Hawaii International Film Festival is happening on Saturday, November 8th, 2014 at 4:00 p.m. at the Dole Cannery Theatre… And it’s FREE!!! 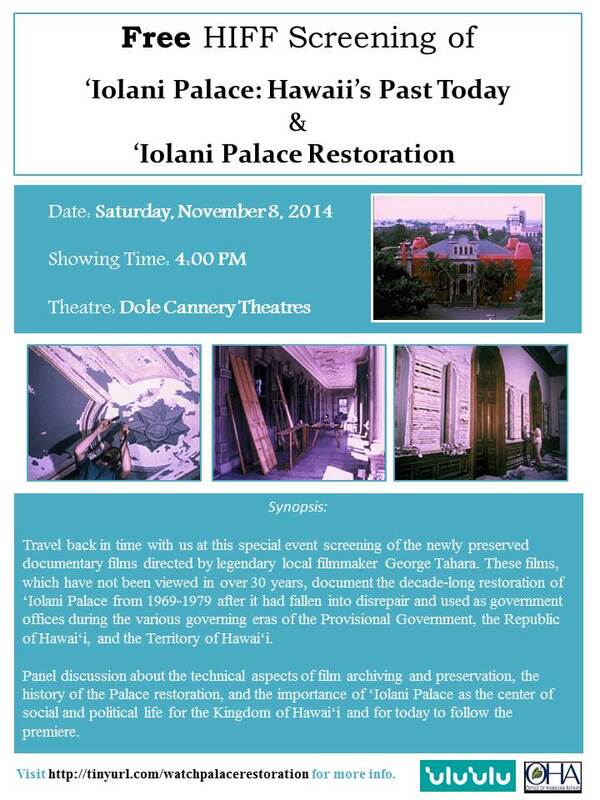 The premiers of the digitized ‘IOLANI PALACE : HAWAII’S PAST TODAY and ‘IOLANI PALACE RESTORATION will be followed by a panel discussion about the technical aspects of film archiving and preservation, the history of the Palace restoration, and the importance of ‘Iolani Palace as the center of social and political life for the Kingdom of Hawai‘i and for today. We hope to see you there! For more information on ꞌUluꞌulu and other repositories, visit AHA’s 5th Edition of the Directory of Historical Records Repositories in Hawai‘i. This entry was posted in Events, News, Repository Spotlights and tagged George Tahara, Hawaii International Film Festival, Iolani Palace. Bookmark the permalink.